A Mediterranean herb and wildflower with star-shaped bright blue flowers in summer from June to September/October. Plants are branched, with hairy leaves, growing to a height of 30 – 60cm. These plants are great for borders, wildflower and herb gardens. The flowers attract lots of pollinators into the garden. This is an ancient culinary and medicinal plant, as the young leaves add flavour to drinks such as Pimms and the flowers make lovely cake decorations and infusions. 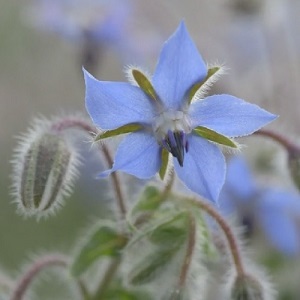 Borage is a hardy annual that grows well in sun to part shade and most soils. It combines well with other wildflowers such as Cornflowers and Field Poppies and more formal border plants. Plants self-seed in the right conditions. Pack of approx 500 seeds. Sow in spring directly into cultivated soil. Sowing instructions and a colour photo are printed on the packet. Sow in spring (March to May) directly into cultivated soil and rake over the seeds to ensure they are covered with soil. Seeds emerge in 1-2 weeks, longer in cooler conditions. Sow in patterns (eg a circle or cross) to help identify weed from seed. Or sow in a greenhouse in spring in cells of compost, to a depth of about 5mm. Transplant seedlings into the ground when they are sturdy, being careful to avoid disturbance. Protect seedlings and young plants from slugs. Remove the plants in the autumn once they have finished flowering. Sow again in spring or shake the seeds into the border in autumn and rake them over to encourage self-seeding.